Lories are known for their intelligence, and they are more than happy to entertain you with the tricks that have learned. They are capable of aggressive behavior if their territory and possessions are not respected and nippiness can occur if this behavior is not managed. Excessive Chewing: Any parrot will chew. In nature, they use their beak to "customize" their favorite tree, to enlarge the size of their nest in a tree hollow. Doing this keeps their beaks in good condition. The problem is excessive and undesirable chewing. Heavy chewing is not a huge problem with lories per se. Most of them never really develop any major destructive issues in that area. However, it is recommended that the owner provide their lory with plenty of "healthy" chewing opportunities (bird toys, natural wood branches, etc.) 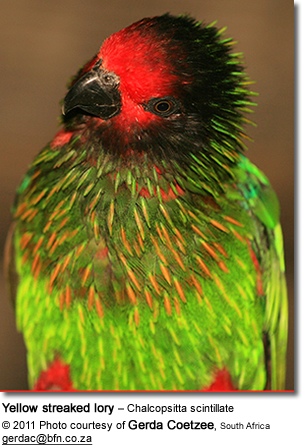 and training is necessary to teach a lory what items are "off-limits." Biting: Lories, as is the case with most parrots, are likely to discover their beaks as a method of "disciplining us" once they are out of the "baby stage." It really is important to learn to understand them and to guide their behavior before an undesirable behavior has been established. If this behavior is unchecked, the lory is likely to be dominating the entire family, chasing and attacking their least favorite humans. Training is vital to stop this destructive behavior. Screaming: Their voice ranges from loud, piercing whistles and metallic "pings" to soft, high-pitched warbles and chattering. Many of them turn into excellent talkers; some having whole sentences in their vocabulary. With a little training they can be taught to communicate with words rather than using their shrill calls for the most part. However, their natural call / voice cannot be entirely eliminated; but their occurrence can be reduced. 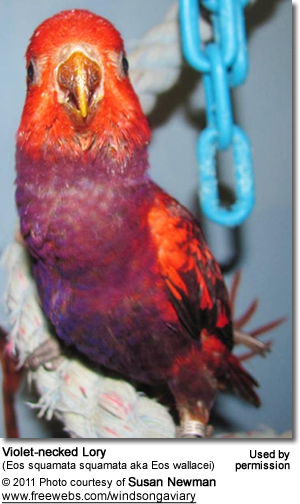 The owner has to understand that even with training, the lory voice can get quite loud, with a high pitched screech.